For example ExcimerLaser with wave length 193nm is used To cure myopia, hyperopia and astigmatism. This laser is able to dissolve the molecules without causing any damage at all at the near tissues. This laser is so accurate that it is 200 times thinner than human hair. Last generation FlyingSpot laser is even more accurate than that and the new technology EyeTracker can lock the laser beam to follow every movement of the eyes and makes the whole procedure even safer. All this data are collected from a computer that makes all the necessary adjustments to correctly shape the layers of the eye (the cornea actually). We can only remove a certain amount of tissue from the cornea and this is why laser eye surgery is mainly used in moderate cases of myopia, hyperopia and astigmatism. In more severe cases larger amounts of tissue needs to be removed and this could damage the integrity of the eye. This is why everyone should go through specific eye examination before performing laser eye surgery. There are two major types of laser eye surgery: PRK (photorefractive keratectomy which is the first type of this kind of surgery_ and LASIK (Laser Insitu Κeratomileusis). Although PRK is the predecessor to the more recent LASIK procedure, it is still used widely because it offers some advantages over LASIK for some people. In LASIK surgery a flap is created on the cornea to access the treatment area, the laser treats the area under the removed flap and then the thin flap is used to cover the treated area, so the cornea remains completely intact. In PRK the cornea's entire epithelial layer is removed to expose the area and no flap is created. 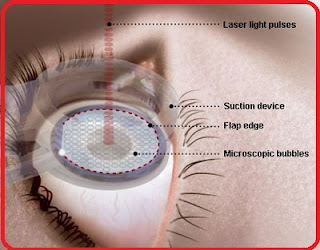 In both cases, before the treatment the computer has been provided with all the data regarding the accurate measurement of myopia, astigmatism and hyperopia of the patient and the computer automatically adjusts the laser accordingly. Who can benefit from laser eye surgery? · While there is no upper limit regarding the age, you must be at least over 18 years old to perform this kind of surgery. · Your vision must be stable for at least a year before the surgery, meaning that your prescription does not change. · Your prescription must not be very high. The higher the prescription the more tissue the laser must remove from the cornea and of course there is a limit. · You must not be pregnant. · Your cornea must be examined first. Each person’s cornea has different thickness. The doctor will examine your cornea first to make sure that your cornea has sufficient thickness and structure. In some rare cases even a thick cornea is not suitable for laser eye surgery if the surface of the cornea is irregular.